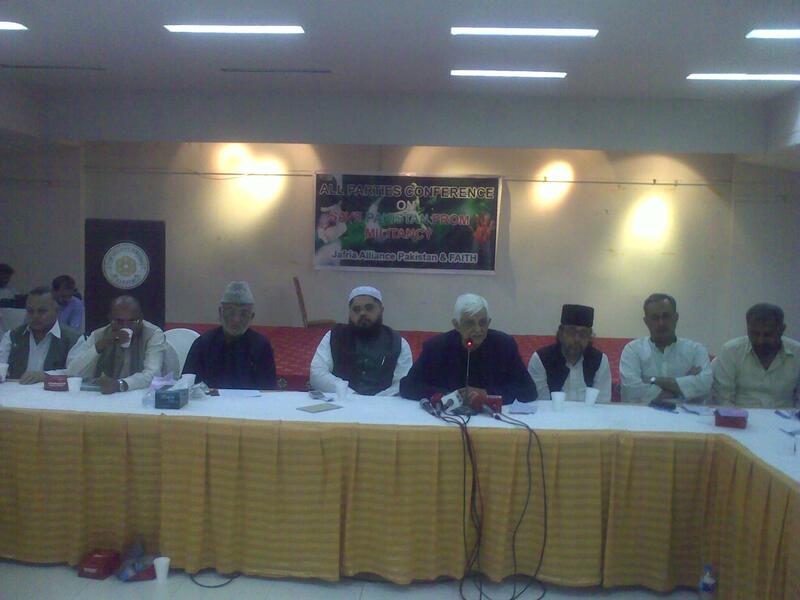 JNN 29th Sept 2014 Karachi : Jafria Alliance Pakistan ( JAP ) in Collabration with F.A.I.T.H ( Forum against Intolerance , Terrorism & Hatred ) convened an All Parties Conference on the Topic “ SAVE PAKISTAN FROM MILITANCY ” on Monday 29th Sept 2014 , at Manzar Akber Hall , Pakistan Arts Council Karachi. JAP has once again Played its due Political Role in raising their voice against the rising Terrorism and Accelerated Target Killing in Karachi and especially the Shia Target Killing , which has once again accelerated in the Karachi City . JAP convened an All Parties Conference to Bring all the Political forces in the Country to Raise their voices Unitedly against the Rising terrorism , and especially the TARGET Killing in Karachi , which is now tearing away the Social Fabric of the Commercial Hub of the Country , and due to this Blood Shed Not only Mass Migration is being Noticed , which is a causing a Brain Drain , and even the Economy of the country is shattered . Representatives of Atleast 20 Main Political Parties of National and Provincial Level attended the conference, which Included Senator Taj Haider Pakistan People’s Party (PPP) ,Mohd Hussain Mehanti , Muzzaffar Hashmi Jamaat e Islami (JI) , Ali Hussain , Ameen Shaheedi Majlis e Wahdat e Muslimeen ( MWM ) , Haider Abbas Rizvi Mutahida Qaumi Movement (MWM) , Firdous Shamim Naqvi , Aslam Rajput Pakistan Tehreek e Insaaf (PTI) , Pakistan Awami Tehreek (PAT) , Owais Noorani Jamiat e Ulema Pakistan – Noorani ( JUP- N ) , Younus Boneri Awami National Party (ANP) , Gulzar Somroo Sindh Taraqi Pasand Party (STP) , All Pakistan Muslim League (APML) , Nihal Hashmi Pakistan Muslim League – Nawaz (PML- N) , Mehfooz Yar Khan Awami Muslim League (AML) . In Addition to the Political Parties , Some Notables were also Invited ,namely the Ex-President of CPLC Jameel Yousuf , Raymond Shepherd – Javed Anwar ( Minorities) . The Conference started with the Recitation of Holy Quran , which followed by the Speeches of Participating Leaders of the Political Parties, in which the participants expressed their views on the Extensive threat of Terrorism in the Country , which is Disguised under the cover of Sectarianism. “Foreign and Inland Funding of Sectarian Outfits ,which is done mainly by Saudi and US Govt should be checked and Plugged , to eliminate Sectarianism and Terrorism from Our Homeland” , said Allama Ameen Shaheedi of MWM. Democracy can not Run Parallel to Militancy , said Senator Taj Haider of PPP. All the speakers at the Conference Unanimously Condemned and Rejected , Religious Extremism and Propagation of Hatred , the center of which are the Religious Seminaries , Which is creating a Mind Set full of Hatred against Different Sects and Religions , and especially Shia Muslim Sect , as this is Now a Global Scenario , in which West and especially US in collaboration with Saudi Arabia and Other Persian Gulf Countries are Heavily funding these Wahhabi Seminaries , which are the real root cause of the Sectarian and Religious Extremism . In the end Allama Abbas Kumaili the President of Jafria Alliance Pakistan , Concluded the Conference By giving the detailed analysis of Root causes of Terrorism and Sectarian Violence and also the Remedies Needed to exterminate terrorism from Pakistan , and he declared in a clear and Loud Message that A war should be waged against the culprits , who are Promoting Sectarianism in the country ,and are root cause of Terrorism . And in the End Allama Baqar Zaidi announced the Resolutions adopted during the conference , Keeping In views of the Participants , which were Passed on Majority Basis. Resolutions Passed in the conference ,demanded a full scale Army Operation in Karachi , on the Pattern of the Ongoing “ Operation Zarb e Azb “ , until the complete elimination of terrorism and Target Killing . They all also demanded the Earliest Execution of the Convicts on Death Row which are about 8,000 convicted by the Courts of Pakistan, as there has been no Execution of Death Sentence , for about 8 Years , as due to Political Bargains of the Successive Govts to have deals with Banned Outfits and Political Parties with Militant Wings , the Death Sentences are being Delayed for Long , to gain their support . They even emphasized that No Clemency should be given to any Terrorist , as it is even against the Islamic Principle , under the Qisaas and Diyat Rules , as only the Heirs of the Murdered Person can Pardon , while NO Other Person is allowed under the Islamic Rules to Issue Clemency to any Murderer or terrorists , who have taken Lives of Dozens of Peoples , and even Openly claims soo . This entry was posted in Asia Pacific, Jafria, Pakistan News and tagged All Parties Conference, Haider Abbas Rizvi Mutahida Qaumi Movement, jafria Alliance Pakistan, JAP, Karachi, Karachi City, Political Parties. Bookmark the permalink.